Some things are just worth posting. Today, The Last Jedi director Rian Johnson tweeted a very interesting series of tweets which explains the origin of Luke’s Force projection power. It’s also an awesome nod to the books and how they can inspire filmmakers and storytellers. Fantasy Flight Games will be reprinting the classic West End Games Star Wars: The Roleplaying Game and The Star Wars Sourcebook as a 30th anniversary edition set. Blurb is up for the upcoming Phasma novel. StarWars.com has an interview with Dan Wallace covering his book Star Wars: On the Front Lines. Penguin Random House is doing a special Star Wars giveaway contest for the holidays with tons of goodies for the winners. Click here to enter. The next Star Wars Insider short fiction piece will be by Mur Lafferty and called “Voices of the Empire.” It ties in with Catalyst and Rogue One and will feature artwork by Jason Chan. The story is about a reporter for the Holo Net News named Calliope Drouth who runs into Orson Krennic. Del Rey has a sneak peak on their Facebook page. Edelweiss has a new entry that looks promising. From the Clone Wars and the Rebellion to the clashes with the First Order, the galaxy is defined by war. Star Wars: On the Front Lines chronicles the tactics, weapons, and armor used in pivotal battles along with profiling acts of valor achieved during the campaign. By focusing on elements of the battles that occurred “off screen,” this collection brings the struggles faced by ground soldiers and starfighter pilots to life like never before and places the reader on the battle lines. Jennifer Heddle announced on Wednesday that Alan Dean Foster‘s novelization of The Force Awakens hit #1 on The New York Times Best Sellers List. However, as of yet, I don’t see it posted on their site so it might be for next week. That said, Star Wars: The Force Awakens by Greg Rucka and Phil Noto is on The New York Times Best Sellers List at #3 for Children’s Middle Grade Hardcover (was #2 last week) and #1 for Children’s Middle Grade E-Book. Also worth noting that Greg Rucka‘s Before the Awakening was #1 for Children’s Middle Grade E-Book at the beginning of the year. Ultimate Star Wars is out today from DK Books and is authored by Ryder Windham, Daniel Wallace, Adam Bray and Tricia Barr. Click here to read our full review. Ultimate Star Wars is an in-depth visual feast exploring the characters and storylines from the Star Wars galaxy. This is a beautifully illustrated guide that is structured chronologically and packed full of information about key characters and storylines from the Star Wars movie saga, The Clone Wars, and Rebels™. Ultimate Star Wars will get new and old fans caught up and knowledgeable on all things Star Wars. You can head on over to the official product page at DK Books for excerpts and retailer links. Here is this week’s Podcasts in Review including my reviews of the live podcast panels I was able to attend at Star Wars Celebration Anaheim. 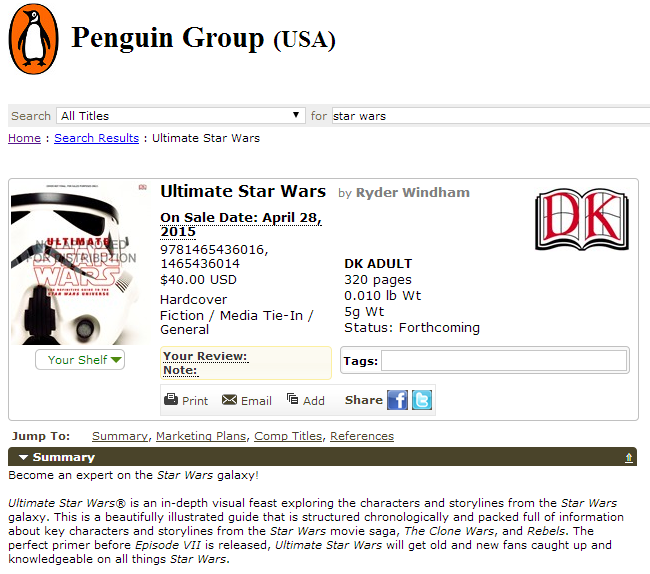 DK Books is conducting a book tour for the upcoming release of Ultimate Star Wars. Authors Tricia Barr, Adam Bray, Daniel Wallace and Ryder Windham will all be participating. Each event will include trivia games, author Q&A’s, book signings and in-store raffles and giveaways. Click here for more details. 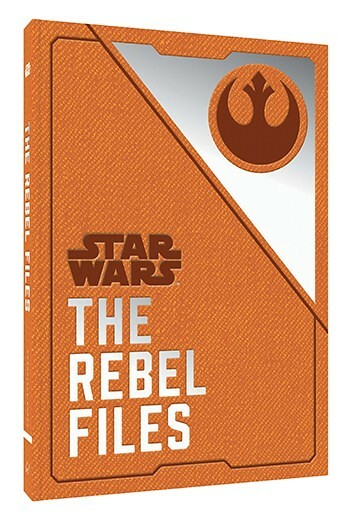 I noticed this entry last week on edelweiss however I didn’t know all the details until I listened to Rebels Declassified – Empire Day which features guests Adam Bray and Tricia Barr. There Adam and Tricia revealed that they both worked on an upcoming DK book called Ultimate Star Wars: The Definitive Guide to the Star Wars Universe. While this is the third Star Wars book for Adam Bray, this will be Tricia Barr’s first Star Wars book, and here at Roqoo Depot, we wish Tricia a congratulations! She’s now part of canon. As the above image shows, Ultimate Star Wars will be out in April 2015. While it only shows the author as Ryder Windham, the book also includes the before mentioned Adam Bray and Tricia Barr, along with longtime Star Wars author Dan Wallace.